www.photomacrography.net :: View topic - What's a crawdad? Posted: Thu Mar 20, 2008 10:51 pm Post subject: What's a crawdad? cyclops asked "What is a crawdad?" I made a brief verbal reply at the time, and Ken explained matters, but I have been meaning to dig this shot out and repost it. This is a crawdad, sometimes called a mud bug, but properly known as a crawfish. This is a captive one photographed with my 1Ds and 180mm macro lens a couple of years ago. I'd posted the photo on our old forum, but since Cyclops could ask that question, obviously the shot needs to be posted again! This little guy is underwater, and he is much prettier than most of the crawdads I've seen! Is this thing native US, or some exotic? And is there a chance (pretty please?) that you could haul out the original image, crop in tighter, and give us more detail of that thing's head and claws? Now here is part of the beginning for some great "jambalaya." Good photo there Mike, this should answer some questions if not make one hungry too. Any Brits should be aware that our native species is exceedingly rare, thanks to the spread of the imported/escapee signal crayfish. They are protected and you shouldn't disturb them, let alone capture one. So presumably if you discovered some american ones here then you would be positively encouraged to eat them! It would be immoral not to! Absolutely! Mind you, I have eaten only the farmed ones. Realistically, even as the much bigger species, they are only a glorified garnish for something more substantial but it is still worth extracting the meat,as it is very tasty; an excuse for a glass, or two, of white wine. (supposedly clarkii is in honor of John H. Clark who [who'd have suspected this!] surveyed the US-Mexico border!). 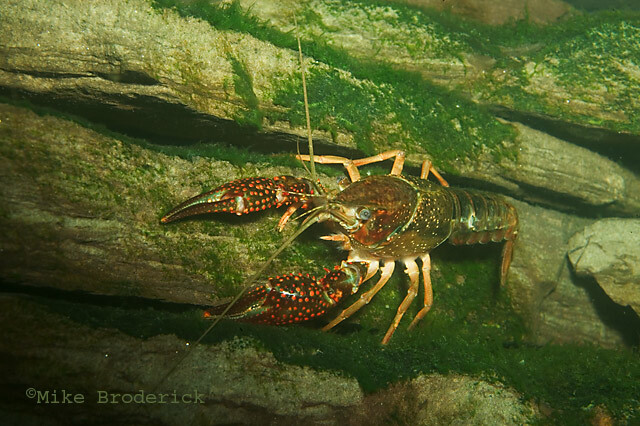 They are native to the Southeast US, but I've certainly never seen a wild crawdad <heh> that looked nearly this good. I know little of crawfish, but from what I can find, it appears the red color is normal and is not a breeding display as I'd suspected. Although native to the Southeast US, they have been brought in as an invasive species in many parts of the world, and generally wreak havoc on the local aquafauna when they do. I'll see if I can dig up the old file--It is safely on two external drives, but I'm computer-crippled now thanks to a motherboard failure on my main puter (so operating off of a laptop, ugh!). A very colourful one indeed Mike! !